Paul F Davis - Weblog | Transformation & Living Your Dreams! Warm greetings from the sunshine state of Florida. Please consider me to serve as your Call Center Manager and Call Center Trainer. I have traveled to over 70 nations as a Corporate Learning Development & Talent Trainer, Worldwide Motivational Speaker, and Author of more than 20 Books serving the U.S. Military, Companies, the Travel Industry, and Universities across the globe for 15 years. I excel at Public Speaking, Communications Coaching, Negotiations & Conflict Resolution, Social Media, Marketing, Writing, Public Relations and Networking. I have earned 2 Master degrees (Global Affairs / New York University and Global Food Law / MSU) and a TESOL certificate (Trinity College London) to teach foreign learners English. I was an English teacher for 3.5 years instructing Asians, Latinos, Haitians, Middle Easterners and Europeans. Tagalog is very similar to Spanish a language I can speak. I also received Executive Education in Marketing (Wharton Business School), Negotiations & Deal-Making (Harvard Business School), Mediation & Conflict Resolution (Hofstra Law School), Advanced Interrogations & Interviews (Reid & Associates – creators of the polygraph for lie detection), NLP & Life Coaching, Google & Media (Northwestern University) and Social Psychology (Wesleyan University). It would be an honor to serve your Call Center in the Philippines. Youngevity’s website does not fully disclose all of the ingredients in its “health” products, especially the harmful preservatives and petrochemicals. In 2014, I bought Imortalium, Youngevity Ultimate Classic and Ultimate EFA. The big print gives and the small (not disclosed on the Youngevity website) takes away. The solvent propyl alcohol is harmful to organs and makes the body susceptible to parasitic infestation. The solvent benzene causes leukemia and cancer, hindering the functionality of the thymus, weakening immunity and making the body prey for parasites and susceptible to AIDS. Wood alcohol leads to pancreatic dysfunction and leads to diabetes. The solvents xylene (or toluene) adversely affect the brain. The solvents methyl ethyl ketone (MEK) or methyl butyl ketone (MBK) adversely affect the uterus of females and pave the way for endometriosis. – Sodium Benzoate (Coca Cola and Pierre Water removed from its drinks because when combined with ascorbic acid it can become benzene – a harmful cancer and leukemia causing petrochemical removed from gasoline in the 1970s). The ingredient I deem questionable, harmful and unhealthy within Youngevity’s Ultimate EFA (essential fatty acid) is fish oil from tuna, which is high in mercury and can cause damage to the brain and nervous system. Youngevity’s business model is such that whenever I phoned the company I was immediately asked for a rep number, as if I were a salesperson working for the company. Whenever I asked nutritional and health information, the sales staff answering calls never could intelligently answer my questions. When I asked for Dr. Wallach’s email to forward my questions, I was given an email for Richard Renton and Johnny Taylor. Although I patiently and perseveringly emailed both Mr. Renton and Mr. Taylor, neither replied. Instead I received a generic reply from Rosary Martinez advising me to attempt to call Dr. Wallach on his radio program (not valuing my time, nor my health related questions related to Youngevity’s products). 1. What minerals are in the “mighty 90” Dr. Wallach refers to during his talks. List them all please. 2. What minerals (names and quantity) are in the plant based mineral liquid formula you sell under the name “Ultimate Classic” compared to what minerals (names and quantity within the formulation) are in the “mighty 90”? 3. Immortalium mentions a proprietary blend, what is in that? I have allergies to some environmental toxins and need to know before consuming. 4. EFA uses fish oil from tuna – what is the mercury content? Tuna is a larger fish with more mercury. 5. The Ultimate Classic contains – CitraSweet, sodium arithabate and natural flavors (please further elaborate on the ingredients within each). Youngevity’s customer “service” staff does not know and could not answer my questions. COO of Youngevity Michelle Wallach (@MGWallach – married to the CEO), has not answered any of these above questions yet either (as of January 19, 2015). Ms. Wallach is welcome to comment here below and tell the Youngevity customers what it is they are consuming and explain why such questions go unanswered for months until brought to the light via social media? In December 2014 when I phoned Youngevity requesting a full refund of their “health” products (which other reputable vitamin companies readily provide to unsatisfied customers – Vitacost, Vitamin Shoppe, Amazon, etc. ); I was told by the sales reps they could give me a credit toward future purchases with Youngevity. I declined as obviously I am not impressed with Youngevity’s products, lack of knowledge, and customer service failures. Do yourself a favor and save money by buying Vitamin Code’s multivitamins http://amzn.to/14NZGdR which are far healthier than what Youngevity is producing and selling. Saving money for the healthier option free of multilevel marketing sales reps is my preferred choice. Paul F. Davis is a World Traveling Food Writer, Restaurant Consultant, Wellness Trainer, Motivational Speaker and Author of more than 20 Books who has touched 72 Countries serving the U.S. Military, Restaurants, Companies, Cruise Lines at Sea, Churches and Universities across the globe. Paul has earned 2 Master degrees in Global Food Law (Michigan State College of Law), Global Affairs (New York University) and is nearing completion of a 3rd Master degree online in Health (University of Alabama). As the author of “The Future of Food” (volumes 1 & 2) http://amzn.to/HVYxX0. I love Chipotle Mexican food, minus the canola oil (canola is a heavily genetically modified crop) in which it is cooked. Unfortunately as confirmed by the Chipotle manager at Chipotle on Colonial Drive in Orlando, Florida the entrance at Chipotle has insufficient lighting and people continue to trip over the curb and injure themselves. The Chipotle manager I spoke with told me Chipotle painted the curb to try to prevent these type of injuries, but I informed the Chipotle manager the paint is not enough if the lighting outdoors is insufficient so customers entering CANNOT SEE THE CURB when approaching from the side parking lot. 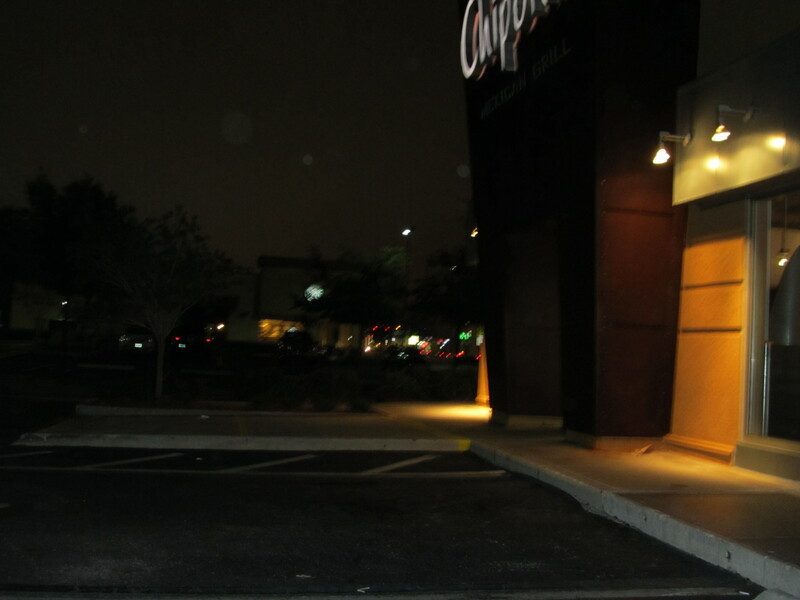 The Chipotle lighting at Colonial Drive does not light the sidewalk entrance and curb, but rather a couple feet of the wall directly beneath the light fixtures themselves (not exactly what most store owners strive to accomplish when utilizing outdoor lighting at an entrance). I tripped, twisted, fell and fractured my ankle on the curb outside Chipotle (which immediately swelled up to the size larger than a baseball when entering Chipotle Mexican restaurant in December 2013). I showed the Chipotle manager on duty and she told me several people have fallen over the very same curb at the Chipotle entrance. My ankle has not been the same ever since. For over a month since my injury Chipotle’s claims adjuster Patti Mann has shown little compassion, offered me nothing for my pain and suffering, neither did she ever provide me Chipotle’s corporate address to file a formal written claim. Hence I found Chipotle’s address via a website online and will proceed to file a claim. Considering Chipotle earns $3 billion in annual revenue, as a matter of corporate social responsibility (CSR) and food integrity, Chipotle Mexican restaurant can and must do better less the good customers take their business elsewhere. Paul F. Davis is a Wellness Trainer, Health Coach, Nutritional Consultant, and Disease Prevention Speaker who has touched over 70 countries serving the U.S. Military, Companies, Luxury Cruise Lines, the Travel Industry and Universities. Recently I completed an application and answered a series of questions for churches seeking to hire a Senior Pastor, Teaching Pastor, and/or Lead Pastor. Therefore if your church, or a church you know does need a Pastor, feel free to forward this to them for consideration, prayer and reflection. Likewise if your church is in need of reformation, heavenly vision, revival, renewal, a great awakening and a spiritual revolution you have found your man to spark a revival and move them Godward to mature in Christ and fulfill the Great Commission. My divine mandate is to encourage people to find wholeness in Jesus Christ appeals to me. People are looking for encouragement, restoration and life principles to be made whole. Wholeness is in Christ Jesus body, mind and spirit (1Thessalonians 5:23, Colossians 2:10; 2Corinthians 5:17; Romans 6:4). As a worldwide minister, life coach / counselor, and fitness trainer I have a unique ability to touch and transform people at three levels (spiritual, mental and physical). Knowing, glorifying and sharing the love and life of God is my heartbeat and personal mission. I am committed to New Testament theology embracing multiculturalism, pursuing reconciliation, being multi-generational and culturally relevant locally and globally – essentially what the New Testament Church should be (Acts 13:1-4; Acts 6:1-7; Matthew 28:19-20; Mark 16:15). I understand the complexities and nuances of spiritual, social and economic development in a diverse urban context. Having lived in Queens (New York City), the most diverse county in the country, I am intimately acquainted with diversity. Moreover I have earned a Master degree in Global Affairs from New York University and ministered around the world having touched 70 nations. I also have lived in the country away from the city and appreciate a slower pace of life giving one time to reflect and reconnect with his or her Creator. Nevertheless I value and enjoy both geographic and demographic contexts as each have their unique blessings, challenges and opportunities for a minister. I desire to welcome and yield to the will of God to build and advance Christ’s kingdom locally and globally. Being a worldwide minister with heavenly vision, a heart for souls, a solid Bible teacher able to make mature disciples, and having the faith, patience and humility to release leaders to exponentially increase your congregation’s spiritual fruitfulness locally and globally; I can powerfully and passionately communicate the Good News of Jesus to your congregation, families, community and simultaneously impart an unstoppable spirit of faith to empower God’s people to live victoriously, be a blessing and impact society. In relate well to different cultures having lived and traveled throughout 70 nations of the world. For example in relation to the culture of Seattle and Washington State, I appreciate their organic food and rich Asian diaspora. I recently authored and published “The Future of Food” (volumes 1 & 2) after earning a 2nd Master degree in Global Food Law. As for Asia, I have lived and ministered throughout the continent for 4 years and also Pastored a Chinese English Congregation for about 3 years. Living in Orlando, Florida I also speak some Spanish and have traveled from Mexico to Argentina being able to connect well with the Latino community. African Americans and I get on well as I appreciate their rich spiritual heritage, struggle for equality, overcoming adversity and Africa itself where I have ministered repeatedly. My inclusive multi-generational focus facilitates both church growth and personal growth. I was raised by my grandparents, for whom I cared in their old age to avoid putting them in a nursing home. I therefore understand the challenges of the elderly (physically and emotionally). In fact I have overcome many physical challenges myself from life-threatening situations while in war-torn and impoverished nations, giving me a unique understanding of how the human body works. My understanding and wisdom relating to health and nutrition can energize the elderly and add years to their lives and life to their years. As for the younger generation with their mobile devices and smart phones, I can provide them opportunities to maximize the media and make an impact locally and globally, while simultaneously teaching them the blessing of being present and uninterrupted engagement. I myself have generated millions of page views online through my videos, articles, pictures and blog posts touching and impacting people throughout the world. In an age of information overload, we are increasingly being spread wide and thin like pancakes and coming up short as people as our relationships become more distant and less meaningful. Present in body and absent in mind, mobile device users (though some argue they are “multitasking”) are in actuality less efficient and effective while having an IQ 10 points lower than their peers. I value education and can help parents improve the academic experience and outcomes of their children. Likewise I can help the unemployed and those in transition reinvent themselves and further enhance their skill set to increase their opportunities in the marketplace. Because personal growth and advancement in all areas of life is important to me, I can appeal to unbelievers and believers alike desiring personal transformation and a new beginning. This present generation wrestling to be relevant in a global economy therefore has a unique set of challenges which I am well equipped to speak and minister to, while simultaneously using and leveraging their talents to spread the Good News of Christ to be relevant in society and make an impact globally. Please contact me regarding any Senior Pastor, Teaching Pastor, Lead Pastor, Interim Pastor opportunities or if you do not need a Pastor presently, but rather are desirous of a visiting minister to come speak and spark a revival and renewal within your congregation to transform your church family and move them Godward to be different and make a difference in society. I pray all the blessings of heaven and earth be yours in Christ! http://www.PaulFDavis.com is a Worldwide Minister, Wellness Trainer and Life-Changing Author of 20 Books including “The Future of Food” (volumes 1 & 2) who has touched 70 nations winning souls, making disciples, training leaders, maturing churches and fulfilling the Great Commission. Overcoming Adversity Speaker to Empower You! Also, here below is my resume should you want to compare me with other Interim Pastor, Senior Pastor, Teaching Pastor, Lead Pastor candidates when you church is in need of a Pastor. Worldwide Minister, Bible Teacher, Motivational Speaker, Author and Life Coach engineering breakthroughs in over 70 countries. Empowers people to transcend their limitations and live their dreams. • Exceptional interpersonal skills to interact with church leaders, laity, people and professionals throughout society. • Life Coach for relational and professional success, leadership strategies, overcoming adversity, creative problem solving, conflict resolution, organization reformation and personal transformation (1994-Present). Personality development trainer to cultivate confidence, competence and self-awareness http://www.PaulFDavis.com life-changing personality development trainer (info@PaulFDavis.com) empowering executives throughout the world. Need soft skills training for your company? Soft skills training entails conflict resolution, emotional intelligence, listening skills and effective communication. One of the best soft skills trainers on earth due to his global travels, living overseas and ongoing interaction cross culturally with people internationally; Paul F Davis is a masterful and astute soft skills trainer. I also like to incorporate emotional and stress management in my soft skills training. As an added bonus depending on the allotted time, I think it is worth the extra investment to have me conduct a full or half-day seminar in soft skills training wherein I can also teach cross-cultural communication. As someone who has traveled to 68 countries and lived abroad for several years, I know soft skills training for call centers and global companies is never complete without cultural awareness and sensitivity training. I learn the most about company employees by watching their body language, facial expressions and the way they carry themselves. Yet these are often not seen by callers connecting over the telephone, but always felt. Therefore I also like to add phone etiquette, listening skills and emotional temperament into the soft skills training seminars I teach. Global business and revenues always increase exponentially and a friendly cooperative culture begins to permeate the corporate culture following my soft skills training boot camps. As a soft skills trainer my expertise is unique in that I have a multi-disciplinary approach combining effective communication with emotional intelligence training, while sharing from my many cross-cultural experiences and interactions (which are heartwarming and funny too). If you are in need of soft skills training for your company, call center, government agency, nonprofit organization or university faculty we’d be delighted to serve you. I travel all over the world and spend a lot of time in Asia helping and empowering growing companies to master cross-cultural nuances, communicate effectively, resolve conflicts, increase sales and revenue and have more fun connecting with their customers. I offer different packages of soft skills training based on every company budget and the corporate goals at hand. Whether you need soft skills training on an ongoing long-term basis or a high impact intervention to bring transformation, I can serve your unique needs. If your company requires a soft skills trainer to continue long-term training in-house kindly contact us so we can design a training program ideal for you and your prized clients. (info@PaulFDavis.com) worldwide motivational speaker, global business consultant for soft skills training and author who has touched 68 countries empowering people of all ages and demographics to transcend their limitations and live their dreams.